Ministers have made fresh concessions to opponents of legislation regulating campaign spending ahead of elections. Charities had warned that the government's Lobbying Bill could have "disastrous unintended consequences" by hindering their campaign work. The government now plans to amend the bill to exempt smaller charities and raise the amount campaigners can spend ahead of the 2015 general election. Labour said it was still a "bad bill" but some charities welcomed the move. Since its introduction to Parliament, the Transparency of Lobbying, Non-Party Campaigning and Trade Union Administration Bill has been repeatedly criticised by those worried it could restrict campaigns by bodies that are not party political. In November the bill's parliamentary passage was "paused" for six weeks. A Cabinet Office spokesman said: "The measures in the bill were never aimed at organisations who do not seek to influence the outcome of elections. "We have listened to the debates in the House of Lords and held discussions with around 50 interested organisations in recent weeks. "These amendments directly address the concerns raised while preserving the core purpose of the bill." Originally the bill would have lowered the maximum that can be spent before groups have to be registered with the Electoral Commission from £10,000 to £5,000 in England, and from £5,000 to £2,000 in Scotland, Wales and Northern Ireland. Instead, ministers now want to raise the limit to £20,000 in England and £10,000 in Scotland, Wales or Northern Ireland. BBC political correspondent Ross Hawkins said the government and campaign groups believe this would - in effect - exempt many small organisations. Plans to reduce the overall UK-wide spending limit before elections from £988,500 at present to £390,000 will also be eased to a new limit of £450,000. In addition, the period during which the spending caps for the May 2015 general election will apply is to be shorted from 12 months to begin instead on 19 September, the day after the Scottish independence referendum. 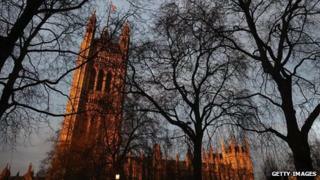 Peers will consider the bill in the House of Lords once again on Monday. Sir Stuart Etherington, chief executive of the National Council for Voluntary Organisations, which first raised concerns about the bill, said: "Much of the risk to charities from this legislation has now been averted. "We are grateful that the government has listened to the concerns charities have raised in recent months. Charities, by law, may not campaign in a party political manner. "However the bill as originally drafted risked sweeping non-party political campaigning into its scope." Oxfam's chief executive Mark Goldring added: "We're pleased ministers have stepped back from the brink and promised to significantly reduce the bill's chilling effect on democracy. "But while today's changes address many of our fears, unworkable limits on constituency spending and the requirement to account for staff costs will still unduly restrict the ability of charities and others to speak out on issues of legitimate concern." Labour's shadow Leader of the Commons Angela Eagle argued: "Ministers have already been forced in to a humiliating pause on this bill for fear of losing a key vote, and now they've been forced in to amending it as well. "While their amendments address a part of the problem, they don't go near solving it. "This remains a bad bill which lets vested interests off the hook while gagging charities and campaigners. It says everything about who David Cameron stands up for." And Lord Harries of Pentregarth, the former bishop of Oxford who chairs the Commission on Civil Society and Democratic Engagement - an umbrella group representing more than 100 non-government organisations - said there were still "major issues" to be resolved. The legislation will also establish a register of professional lobbyists and changes the legal requirements on trades unions to keep membership lists members up-to-date.